Sakura Watch, April 13, 2014 - Little change and likely early May bloom is the direction the trees throughout the park seem to be indicating. 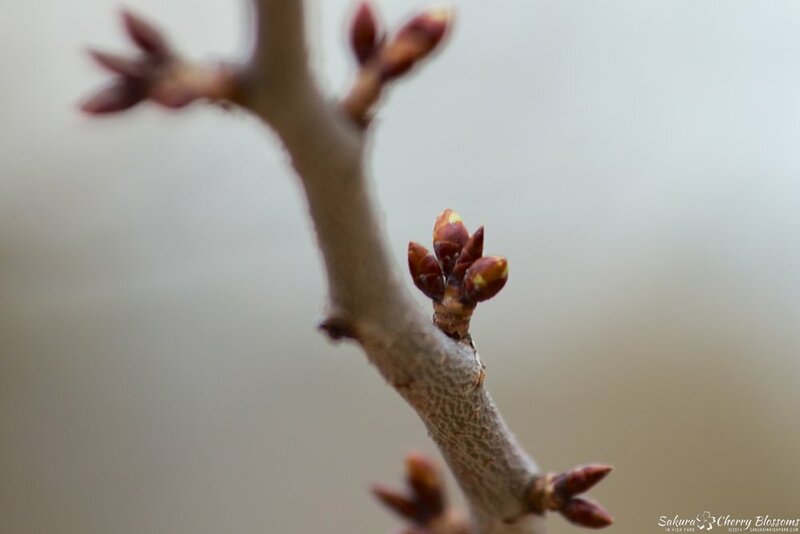 After a few days of warmer weather, there has been little change to the overall size and shapes of the blossom buds with nearly all of them still closed, and only a handful is hinting at any green tips, most notably the trees near the sports fields. I would like to believe that the trees are keeping things shut tight in anticipation of a sudden cold snap with possible snow this coming Tuesday - this winter just won't give up! In any event, the next check later in the week will help reveal if any change will come once the warmer weather becomes the norm for 2014. Looking back at previous years and the time it took for the trees to change from buds to first blooms usually took between 2-4 weeks, the timing always dependant on the weather - warmer, calmer weather helped bloom faster; colder, disruptive weather pushed the blossoms to be later. The only plus from all of this is that there is a good chance the blooms will be around for Mother's Day which you know will draw big crowds that weekend!